The coin pictured is the one you will receive. West Point Mint. 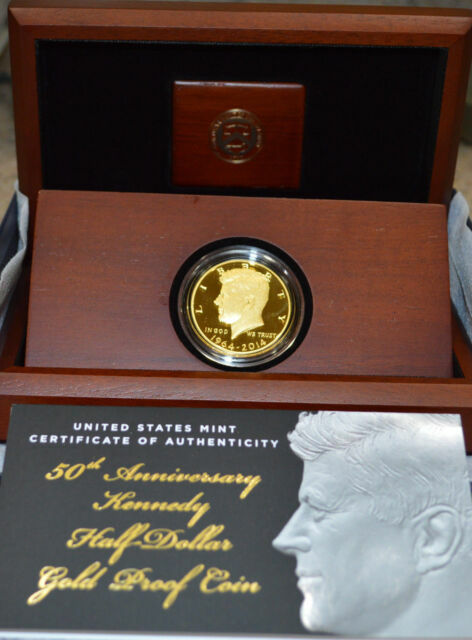 2014 50th Anniversary Kennedy Half Dollar Silver 4 Coin Set. In my opinion this tribute to celebrate the "FIFTY YEAR" issue of the "KENNEDY" half dollar was very well executed ! I bought three and believe they will become sought after more and more as time passes ! Consider these for your friends and family to remind them of this "PRESIDENT" and his accomplishments ! A good buying experience...a good coin to have in your collection. It's an nice commemorative gold coin, but I probably bought into the hype of the anniversary year. Who knows, it may well go up in value, but this may take some time, got to be patient with investments. the quality of the coin was great, the coin was advertised at 1050.00 and when i received my bill there was an additional 40.00 + dollars added to my bill!